The 49ers are now 36-1 in sets this season and have collected 29 consecutive set victories. They did down Loyola Chicago and Lewis earlier this season, but since that point in mid-January it’s been a bit since LBSU has taken on a top 10 opponent. That streak ends ths week as they see a monumental clash with UCLA. The Bruins set themselves up for a match with the top team in the country after adding to their already deep resume with three more ranked wins. That makes eight wins this season for UCLA vs. teams who at the time were ranked in the VolleyMob Top 20, including six in the top 10. After a week off Hawaii has one more week of a break – although they do have their alumni match in store for Sunday. They’ll look to come out of the time off refreshed and stronger as UC Irvine awaits them on the other end. It was an off-week for UC Irvine, although they did have their alumni match. They’ll hope that prepares them well for this week’s match with Pepperdine before they begin Big West action the following week in Hawaii. In their MIVA opener, Loyola Chicago didn’t put up their best performance as they tested out a multitude of lineups and 14 players saw time. They got the win though, and that number went down by a few for Lindenwood as they earned the sweep. The Cougars got their first win in MPSF action of the season as part of a two-win week over top 20 opponents. They weren’t huge standout victories, but it did tack onto a lengthy resume. Ohio State is a fantastic team for their seventh ranking, showing the true depth of contenders this season. They sit at this spot right on the verge of moving up after they got things off on the right foot – although tightly with Ball State – in the MIVA. Lewis kept pace atop the MIVA with their two other counterparts in the top 10 in what is looking to be a three-team race at the top. Fort Wayne still could insert themselves into the bunch, but Lewis can knock them down a peg when they head on the road this week. The Nittany Lions continue to be without Calvin Mende but they’ve now won three in a row against solid competition, including this week in a road sweep. It’s starting to look like Penn State could be the runaway favorite in the EIVA too, as they look to make the NCAA Tournament via automatic bid. Grand Canyon suffered a bit of a setback against UCLA in their big moment to shine. They still got a win over Pepperdine though and aren’t penalized too much for losing to a fantastic Bruins team, but we’re still waiting on proof that Grand Canyon can beat the best of the best. UCSB had one off week and now will get another as they hope to rest up and train to get better into the Big West season. Following this week where they are idle, they’ll take on Pepperdine and then start Big West play against UC San Diego. CSUN had a split week in which it swept Stanford and lost but had impressive flashes at #2 UCLA. That moves them up into the top dozen as they now look to improve their game with time off and just the alumni match ahead this week. Fort Wayne split their week, but with teams directly below them also losing and their loss coming on the road to Ohio State, they only slip to 13. A split this upcoming week would gladly be welcomed as they face the two other top 10 opponents in the MIVA in trying to prove they belong in the conference title race discussion. Pepperdine came so close to upending Grand Canyon in five, in which they would have gotten a big boost up the rankings. However, the loss keeps them at 14 as they’re still looking for a win over a top 15 opponent. Saint Francis has now lost three consecutive matches against tough opponents, yet they still stick around their spot in the rankings with a lack of winning below them. They’ve got a chance to get back to their winning ways this week as they look to keep pace and not allow the EIVA to be a one-team race. The Trojans finally ended their seven match losing streak and got their second win over a Division I-II team of the season. It wasn’t easy, but they squeaked it out and even showed some strong play in a loss vs. BYU. Things won’t get easier as they continue MPSF play. UCSD couldn’t take advantage of so many losing in front of them and also suffered a few defeats. They kept things tight through points in both, as they came close to downing Concordia Irvine and earning the sweep. They stay in front of the Eagles though as they have a better overall record and downed them at home in four sets. The Eagles scored a big won over UCSD for two reasons: (1) they avoided an 0-3 week and (2) it came over a solid UCSD bunch. Things get even more important this week as they start up MPSF action. The Cardinal have played a brutal schedule, which isn’t a good mix for some injuries and struggles they’ve had early in the year. It doesn’t get any easier, so they’ll have to figure something out to avoid being buried in the MPSF standings. 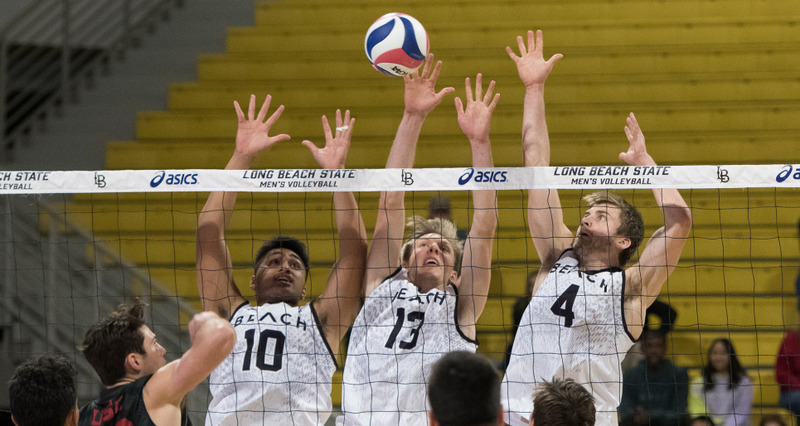 The Patriots earned a solid win over Barton but were then downed in three by Long Beach State for a split week. They’ll embark on EIVA play this week as they try to make a mark on a wide open conference this season seemingly outside of Penn State.